For a long time now, it's been my dream to write/blog for a living and travel. While it's something that I have a huge amount of passion for and a massive desire for, it's also something that scares me sometimes. Writing isn't necessarily the easiest or steadiest profession to get into, and traveling can also be challenging what with accommodation, language barriers and funds making a huge impact on how smoothly your travels go. 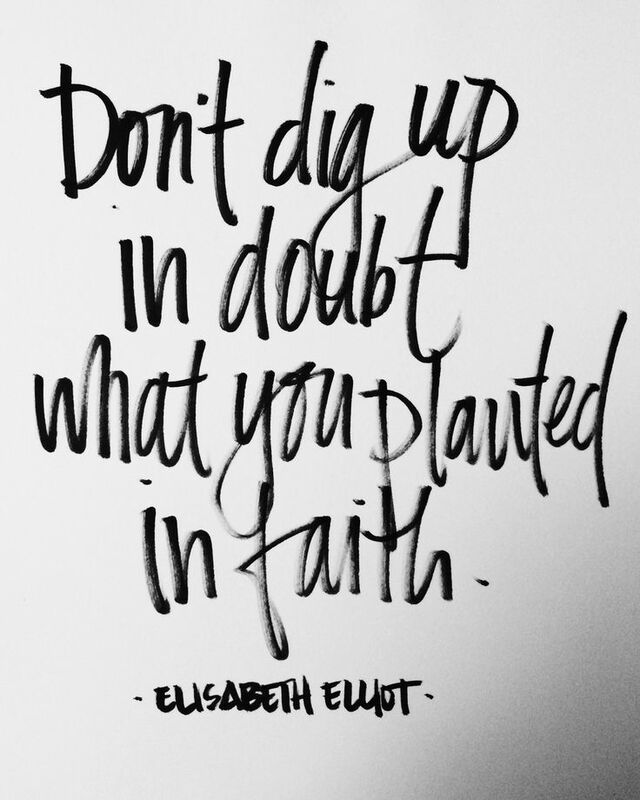 But, this quote reminds me that I planted that dream in faith, with a genuine belief that I can make it happen, and that I shouldn't dig it up in fear-induced doubt. When we dream big, or even small, there will almost always be times when our faith shakes, and doubt fills the space that our confidence and self-belief once filled, and suddenly we feel as though our dreams are too big, too risky, maybe even unrealistic. This is often what leads us to give up on the things we truly want – not a change of heart, or unsuccessful attempts at achieving or obtaining those things – simply our own doubts, which are so often based on hypothetical obstacles or imagined complications rather than actual events. The fact our doubts so often lack solid foundations is what makes giving up our dreams for them so much worse; our dreams and goals had solid foundations to begin with, and that's something that ultimately no amount of doubt should be able to shake, particularly when that doubt has nothing to support it. Of course, this doesn't just have to apply to dreams and aspirations. It can apply to many other things: relationships, friendships, religion, projects and so on. Anything that we plant in faith needs to be left in the earth so that its roots can grow stronger; the more we let those roots grow, the harder it will be for us to dig them up in moments of doubt, and so those roots will grow stronger still, and our faith will become firmer and more enduring. So when you start to feel a little uneasy, and you start to doubt your aspirations, or your own ability, or one of your relationships, remember when you first planted that little seedling. Remember how much you wanted it to bloom, remember the determination you felt, the faith you felt. Remind yourself of those things, and leave those roots firmly fixed in the ground, undisturbed by your doubts.